Glamorgan produced a brilliant run-chase to beat Surrey by four wickets at The Kia Oval, reaching their target of 195 with six balls to spare. Graham Wagg and Kiran Carlson, who hit 46 not out and 58 respectively and shared a partnership of 63 in the process, provided the key innings’ for the Welsh side. The result lifts Glamorgan up into mid table in the Southern group, and for the moment stops Surrey’s attempted charge towards the top spots. 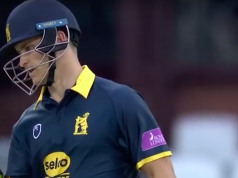 Wagg, a wily campaigner with a wealth of T20 experience under his belt, was there at the end as Andrew Salter hit the winning run off Jade Dernbach who, like the rest of the Surrey attack, was distinctly off-colour. In fairness, Dernbach and his colleagues were not helped by the ground dimensions – the boundary looking left from the members pavilion was short to say the least as the pitch was on that side of the square. The visitors utilised that short boundary as much as possible, regularly smacking the ball into the stands from balls that would normally have been hit towards the gasworks side. Surrey’s bowling attack simply could find no answer to what was essentially a sustained slog from the Glamorgan batsman; as each new player came to the crease, his remit seemed to be basically to smack as many deliveries out of the ground as possible. Craig Meschede (who hit three consecutive sixes off Gareth Batty in what was possibly the key moment of the run chase), Karlson and Wagg all dominated the bowling, paving the way for what was a relatively calm finish. Surrey, in hindsight, may look at their decision to bat and wonder if it was a mistake. The freedom with which Glamorgan played suggested there were few, if any, pitch-based demons, while during their own innings several batsmen looked unsure at times as to what a good score would be. Indeed, despite an innings strike rate of a tick under 200, this was a batting display from the home side that seemed to stutter somewhat. 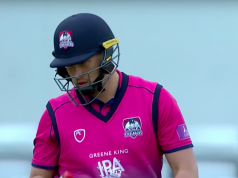 Both Aaron Finch and Jason Roy got out cheaply after making bright starts, leaving Nic Maddinson, who made 70 off 45 balls, to be the stabilising influence Surrey needed. The New South Wales import has flirted with making the Australian team for several years without ever really making the decisive breakthrough, but here he served evidence that his raw talent is considerable. Indeed, in hitting five fours and three sixes Maddinson surely would have thought he’d done enough to get his side to a winning total. However, it was another moment of brilliance from undisputedly the overall man of the match which cut Maddinsons’s innings short, probably saving the visitors 10 runs at least in the process. Wagg, whose four overs were accurate, nagging and cost a mere 21 runs, ran the Aussie out with four balls to go at a time when Maddinson was looking to cut loose. One wonders if Surrey thought they’d seen the best of Wagg for the evening when their innings finished. To their great cost, they were proved definitively wrong.